"41HP1, 33, GP 41062, TARL 2017.0131" by Timothy K. Perttula and Robert Z. Selden Jr.
DECORATION (INCLUDING MOTIF AND ELEMENTS WHEN APPARENT): The rim panel has four sets of slanting engraved scroll lines on either side of a hooked arm element. The upper and lower scroll fill zones have excised columns and negative zones. 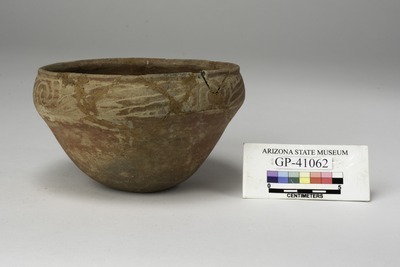 Taylor Engraved carinated bowl from the Culpepper site (41HP1).